We were in the French countryside a few summers ago for a birthday. An important birthday. One of us was flipping a first digit. To celebrate, we wanted the full cliché for dinner: fussy appetizers, deep braises, rustic tarts. As we rounded a particularly sharp curve in the Dordogne—that region in southwest France responsible for duck confit, foie gras, black truffles, and wines to sigh over—we sighted a small restaurant seemingly carved out of the cliff. Checkered curtains framed casement windows. So far, so good. We ventured inside. The small dining room was glistening wood and chintz. Madame la Matron spotted us from across the room and lurched toward us on rickety hips. She was amiable but curt. Busy, it seemed. She nodded her approval at our making a reservation in person rather than on the phone, jotting us down in her book and spelling our American names without pause. Then she shooed us out, advising us not to be late. When we returned that evening, Madame was less rustic—and less amiable. Clad in a white linen suit stretched over a black T-shirt with “Yves Saint Laurent” spelled in glitter across her ample bosom, she bore down on the business of dinner, hurriedly pushing the apéritif de la maison on us. When we asked what it was, she launched into a gauntlet of words, none familiar. As former travel correspondents in France for Wine Spectator, we like to think we know our way around wine lingo. But maybe she was singlehandedly reinvigorating a lost dialect. “Oui, oui, oui,” we muttered. In for a penny, in for an apéritif. Madame rushed as much as she could to the bar, clicking away on her tottering heels across the resonant dining room, then almost immediately reappeared, click-click-clicking as she whisked our cocktails to the table. The drink, whatever it was, was gorgeous. We took a sip. It was flowery, summery, thirst-quenching, served up in a wine glass. And it was cold. Very cold. A wine cocktail of sorts, it was pleasantly herbal, a little sweet from the wine, balanced by a small lemony spike on the finish. We took another sip. Ah, the clichéd life. This was costing Madame time. She tapped her order pad. As our relationship evolved over the course of the evening, our language difficulties thickened. Each time one of us tried to get a sentence out in our admittedly too-textbooky French, she winced. By the time we got to the wine list, we’d become nonverbal in the face of her exasperation. We simply pointed to a name. “The wine is exhausted?” we asked. She lost all patience and a dumpy English matron stepped out from behind the faux French façade. “We’re all out,” she hollered in her most Fawlty Towers–ish voice. “I’ve sold the last bottle.” Her gentility, it seems, was a veneer. The Brits. They’re buying up Eleanor of Aquitaine‘s dowry one building at a time. Her façade laid bare, she no longer seemed to feel any compunction. From that moment on she descended into complete stereotype. She chased off people who walked in without a reservation. She stomped around the dining room swinging a bread basket shaped like a goose from her arm, making it quack “Jingle Bells” by squeezing its bill. There were vulgarities uttered loud enough for the entire restaurant to hear when one couple, of ethnic origin other than her own, requested their table. Suffice it to say, the prospect of a simple evening with a deep braise and a rustic tart was lost. The night’s saving grace was that cocktail. When Madame la Matron brought our check, we asked what exactly was in the aperitif. We simply stared. Her audacity knew no bounds. “It was an aperitif of white wine, bitter lemon, and St-Germain,” she added. Ah, St-Germain. Floral, delicate, light. We should have known. An old-fashioned libation, the liqueur artisanale has long been distilled from the highly perishable elderflowers gathered by hand from the foothills of the Alps. They’re macerated for weeks in alcohol, then the distillate is mingled with a little eau-de-vie to lend it even more character. The bottles, as has long been the tradition, are numbered to indicate the flower’s vintage. 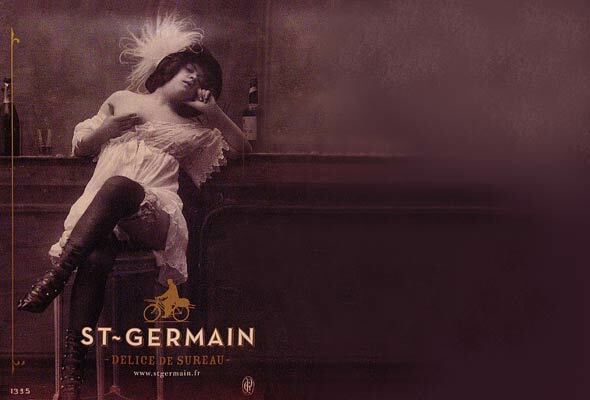 St-Germain has become quite the trendy thing across North America, a hit among the hip set. You’ll find it everywhere. Odd, given how far removed this scene is from Madame’s dining room and the local elderflowers. On our way out, Madame asked what we did for a living. We told her we were food writers. Not exactly. But we hate to disappoint her. Should you choose to stir this lovely wine cocktail rather than shake it, reach for the wine bottle first. According to the wise folks at St-Germain, this will assist in your cocktail-making endeavor, because the liqueur is denser and will sink and meld with the wine, making your job quite an easy one. Their online cocktail-making tutorial continues to explain that “If you pour the St-Germain first, it will tend to sit under the wine rather than mix, which the wine may find rather rude, especially if it’s a good vintage.” For more savvy and sassy insights into concocting this and other libations calling for St-Germain, check out their site. 1. Shake the wine and St-Germain with ice, then strain it into a highball or wine glass. Top with a spare splash of lemon soda. Madame la Matron’s Apéritif de la Maison Recipe © Bruce Weinstein and Mark Scarbrough. All rights reserved. All recipes and photos used with permission of the publisher.